Bella Hair Designers is a single-location Los Alamitos hair salon dedicated to your beauty and image and helping each client look their best. Though we primarily service Los Alamitos, Rossmoor, Cerritos, Seal Beach and Long Beach, California, areas, we have clients from many cities in Orange and Los Angeles counties and beyond. 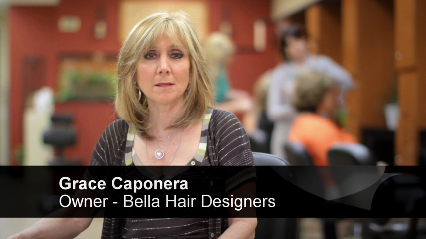 Bella Hair Designers is open Tuesday through Saturday with convenient, flexible hours. Our hair stylists and nail technicians are career specialists and trade professionals. We are passionate about our style, our products and our tools, and combined with our talents, we create the image to enhance your natural beauty! If you look good on the outside, you will feel good on the inside! Our team of friendly, creative professionals at our hair and nail salon, assist you in making the most of your hair. Our stylists attend classes to constantly improve their education in this industry. We also provide you with a complimentary color consultation to advise you on the colors and techniques best suited for your skin tone. Our goal is to give you a beautiful style that fits your personality, lifestyle and image. We began our salon in May of 2008 with a complete remodel of the existing store from floor to ceiling to walls. We designed our floor plan to maximize the operators' need for space, lighting and behind-the-chair ergonomics – enabling the stylist the very best conditions to enchance their ability to deliver their talents to you. We strive to make you feel comfortable as soon as you walk in and to provide a pleasant and enjoyable experience during your stay. At Bella Hair Designers, we believe the hair products you use are vital to making you look and feel your best. AG Hair Care Products from Vancouver B.C., are found only in a select group of salons nationwide. If you are considering a Keratin Smoothing Treatment, consider a free consultation to decide whether this is the best option for your hair. Walk-ins are welcomed but appointments are recommended. Schedule an appointment today with our professional team for glamorous hair extensions and acrylic nails. Fashions come and go but style is eternal! Our motto is also shared by AG Hair Care Products, our partner and manufacturer of our exclusive line of hair care products. Our AG products are available from our salon or by mail order directly from this site. Our patrons are not the only ones that prefer AG Hair Products – many celebrities and fashion events specifically ask for AG as well! It works! Other quality products we are proud to carry include Rusk, Paul Mitchell and Moroccan Oil. All products purchased include professional consultation from one of our highly experienced professional stylists. Call today to make an appointment with one of our hairstylists. We can accommodate even the busiest schedules! Call today.